Do Body Wraps Help Cellulite? 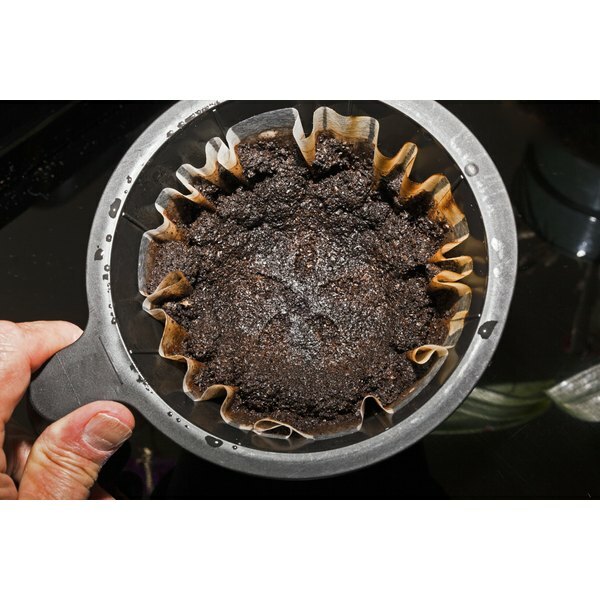 A coffee filter basket with used grounds. Caffeine is a primary ingredient in many pricey store-bought cellulite creams. Thankfully, you can make your own cellulite treatment at home for a fraction of the cost. After enjoying your next cup of morning coffee, save your warm coffee grounds. When applied topically to the skin in the form of a wrap, coffee grounds may be an effective way to smooth out the lumpy appearance of cellulite. According to the Mayo Clinic, 80 percent of women have cellulite. Seen as a dimpled or knotted texture on the skin, cellulite is a type of fat that doesn’t easily disappear without some type of alternative treatment. Caused by heredity, hormonal changes, poor circulation or an accumulation of toxins, the cottage cheese-like appearance of cellulite often develops in women's thigh and buttock areas. Applied topically, caffeine works on cellulite by increasing circulation to the affected area. This may help remove toxins and excess water from the tissue, thereby lessening the dimpled texture. The stimulating effects of the caffeine found in coffee can create a more toned and taut appearance. However, any noticeable improvements caused by the topical application of caffeine will only be temporary. Gather about ¼ to ½ cup of fresh coffee grounds in a bowl. Add about 2 tbsp. of extra virgin olive oil to the coffee grounds and stir them together. If the coffee grounds are not warm from recent use, warm them up in the microwave for about 10 seconds. Standing in the bathtub or on some old newspaper, take a loofah mitt and massage the warm coffee grounds and olive oil in a circular motion. Work this solution onto problem areas such as the thighs and buttocks. Leave as much of the coffee grounds sticking to the area as possible. Use plastic wrap to create a firm wrap around the area. After staying wrapped for about 10 minutes, remove the plastic wrap and wash the area with warm water. Try adding a few drops of juniper or rosemary essential oil to the mixture. These oils are commonly used in body wraps for their cellulite-fighting properties. According to CelluliteTreatment.org, wrapping seaweed around the area before applying the plastic wrap may also boost the treatment's effectiveness. After applying the plastic wrap, use an old-fashioned rolling pin to help smooth out the skin. Simply roll it over the problem area as you would roll out dough. As an alternative to the rolling pin, knead the area with a hand-held cellulite massaging tool found at high-end cosmetic counters such as Lancome or Clarins. Repeat this ritual at least twice a week for the best results. Hot coffee grounds applied to the skin can cause serious burns. The coffee grounds should be warm to the touch and never hot. Minors should perform this procedure only under the supervision of their parents. Pamela Gentry is an experienced writer specializing in original articles, blogs, product reviews and website copy. Her specialties include interior design, health and wellness and advertising. Gentry currently writes various types of content for Scripted, Writer Access, CopyPress, Get a Copywriter and Gated Publications. What Are the Benefits of Coffee for Skin Care? Can a Foam Foller Get Rid of Cellulite?